Now is the time to come into Portstone and browse our selection of fruit trees that you can plant at home to enjoy great tasting fruit in the summer months. It really is easy to plant, care for and then be rewarded with the best tasting produce. Nothing beats a freshly picked piece of fruit you have grown yourself. 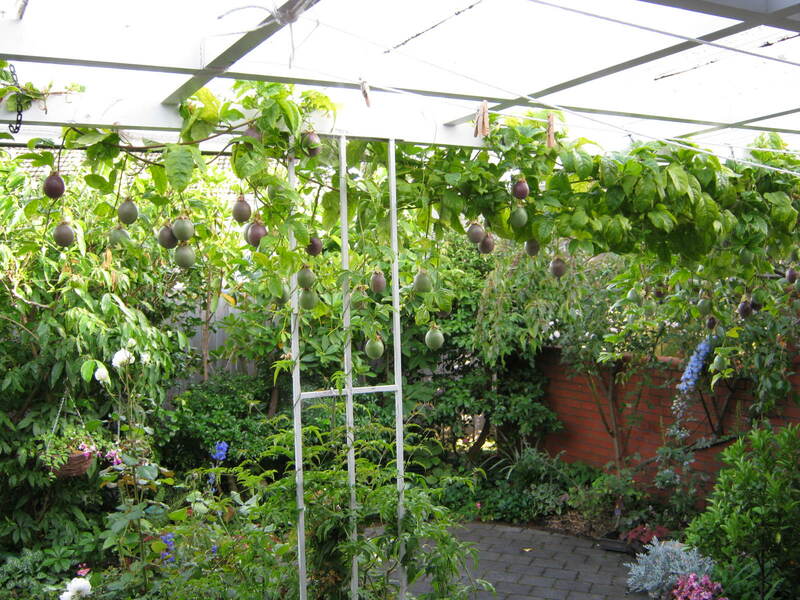 Portstone has Citrus, Berries, Grapes and Fruit varieties that will suit your garden. Preheat oven to 220 degrees. Place butter, almonds, sugar and yolk into blender, process until smooth. Cut 8 circles of pastry and make a edge, place on oven tray, spread some almond mix on each pastry round and then cover with your choice of fruit – sliced feijoas, fresh or frozen berries, or grated apple and mixed spice. Brush the edge of pastry with egg white. Sprinkle each pastry with castor sugar and bake for 12-15 mins till golden brown. Garlic is traditionally planted on the shorted day, but you can plant anytime between June and August. It is one of the easiest crops to grow, it takes up hardly any room and once you plant it requires little care. Garlic is the perfet companion plant for roses – plant under roses to control greenfly. 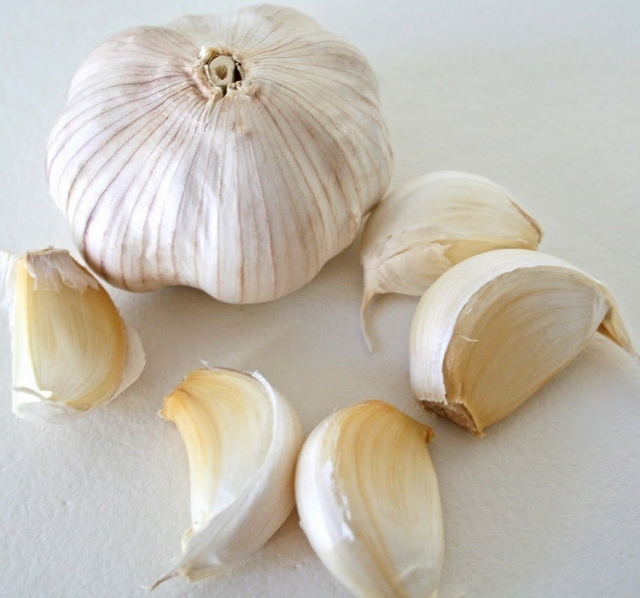 Garlic has antibiotic and anti-viral properties. Note – Garlic in supermarkets is often not best to plant in the garden as it has been treated to stop it sprouting. 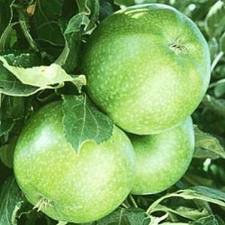 How to harvest passionfruit? Just let them fall, then pick them up, it’s that simple. The skins are tough so they don’t bruise. It is often said you should leave them to go wrinkley, to ripen, but in fact they are ready to eat as soon as they have fallen. They may however, get a little sweeter as they get older. Cut them in half, scoop out the pulp, and saver the flavour. 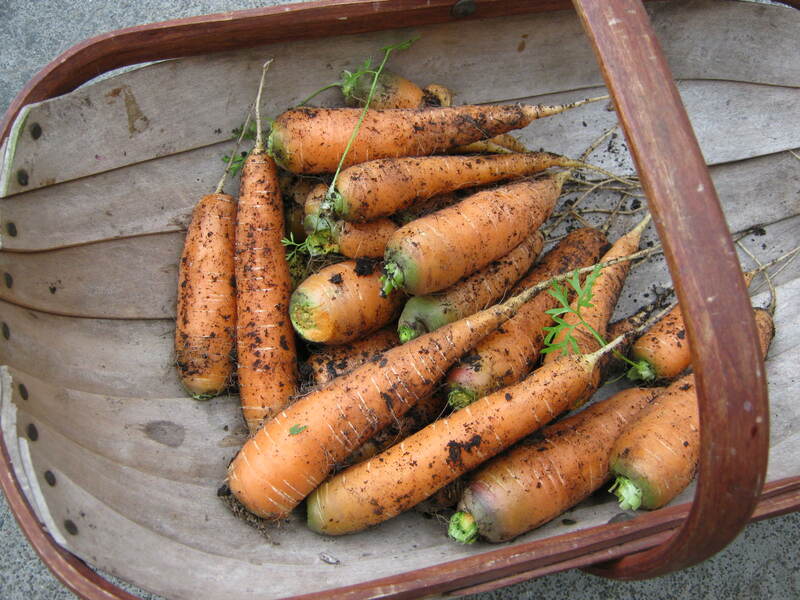 I have been harvesting carrots over the last few weeks and thoroughly enjoying them. They are crisp and juicy when eaten raw, and tender when cooked. The variety is Berlicum from Kings Seeds. I have pulled one or two and discovered that they have split, so I decided it must be time to harvest them all. I washed them, dryed them and put them in the fridge in a plastic bag but left the bag open so they won’t go mushy. I blanched and froze some of them. 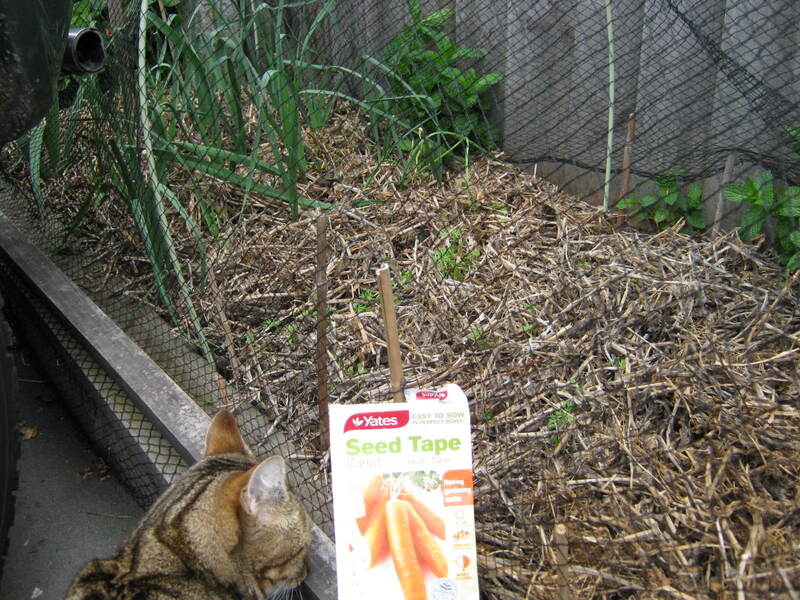 Then I sowed some more seed. This time I used Yates Seed Tape. It’s really easy to use, just make a shallow trench and lay the paper tape in the bottom, then lightly cover over. I sowed some a few weeks ago, then some more and now a third lot, so I will have succesive harvesting. You can just see the first carrots coming up. Planted at the left end of the bed are leeks. Buy a bundle and plant now. I harvested all my red onions because the tops were getting powdery mildew and I didn’t want the disease going down into the bulb. As it is a few of them are soft and floppy in the stem just above the bulb, so if I had left them, the onion may have started to rot. I will use the soft ones first. The rest are laid out on the concrete in the sun in order to dry. Once the stems are completely dry, they should store OK. 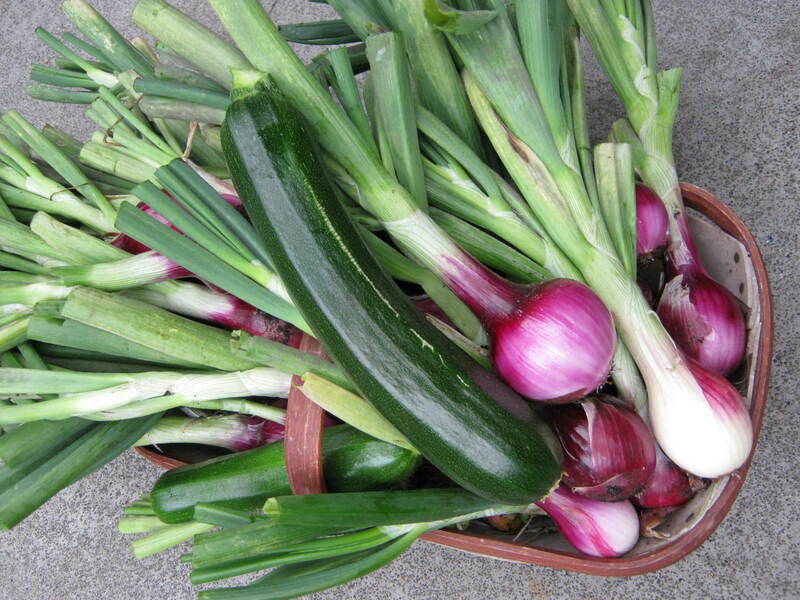 I got 40 onions, plus a few that I have harvested over the last 2-3 weeks, all from a $2.99 punnet of seedlings. I reckon that is pretty good value. I have four Dovyalis “Tropical Apricot” trees growing in pots. There are a few fruit on them, just small at the moment but I am looking forward to them getting bigger and riper. I believe they have an apricot flavour. This is a large semi-deciduous shrub growing to about 5 metres tall and 5 wide. Fruit are produced during the warm season at various intervals and are yellowy when mature. The flesh is yellowy-orange, very soft with a distinctive apricot flavour. 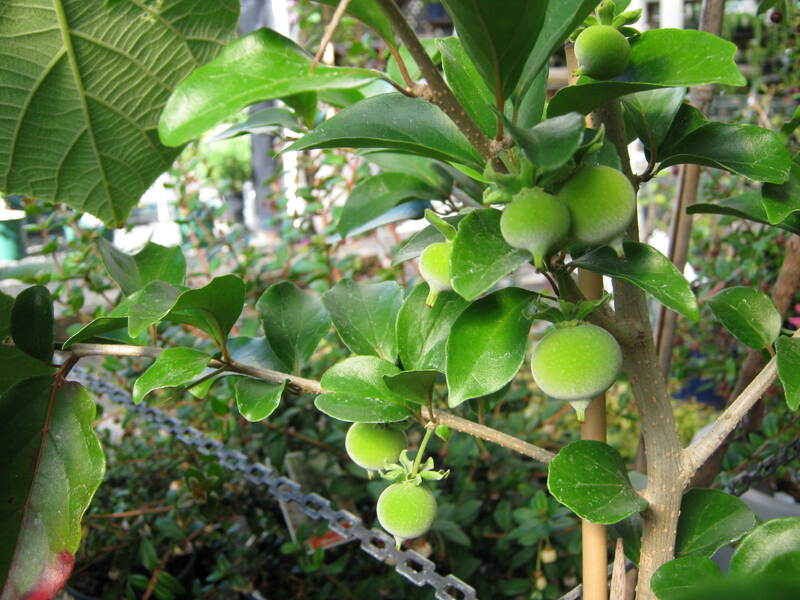 They can be eaten fresh or used for jellies, jams, pies and drinks. The Doyvalis can be made into an excellent wine. They can grow in a wide range of soil conditions but benefit greatly from being fertilized reguarly. Put down a good mulch to keep the roots moist during dry spells. Doyvalis will cope with light frosts, down to about -3 C, but you can spray with Vaporgard to give an extra protection against frost. There are few pests that bother Doyvalis, but birds might eat a few. Watch this space to see the fruit ripen! I made jam from freshly picked blackcurrants and compared the taste with bought stuff. My jam had a stronger flavour and fresher taste. It’s a really easy jam to make. Pick 1kg of currants, and wash them. Boil 1.5kg sugar with 800ml water, for 5 minutes, uncovered. Add blackcurrants and continue to boil for another 5 – 10 minutes. Pour into sterilised jars, and that’s it. Jam made! 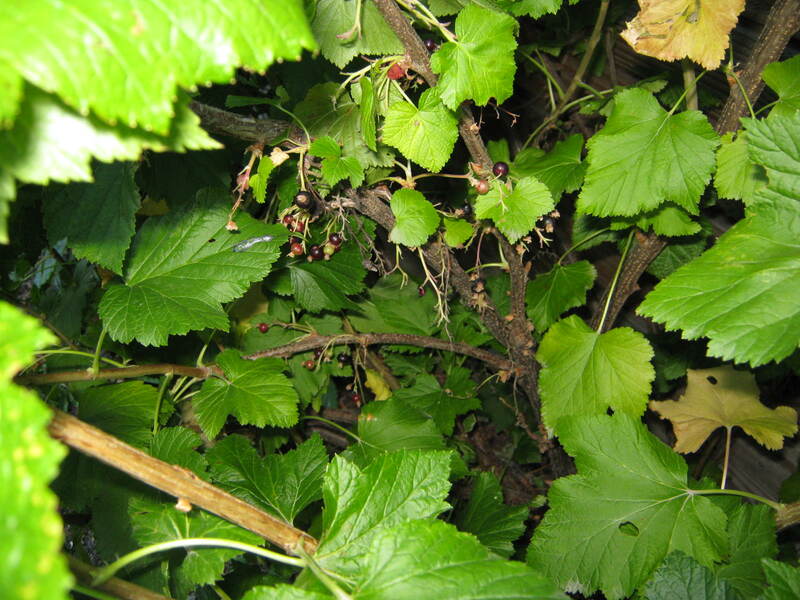 The currants are also very tasty eaten fresh, but possibly a little tart for a lot of people. I’ve added them to my ‘berry delight’, of mixed fruit with muesli and yoghurt. Yummy! I took the photo after harvesting, so its only the little currants that are left. Hopefully they will continue to grow and I can have some more! Enter your email address to receive notifications of new garden tips by email.